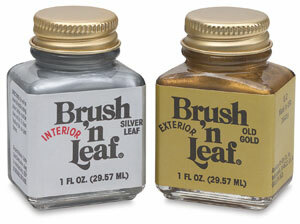 Interior Brush 'N Leaf — Decorate, stripe, or highlight with genuine leafing metallic in one brush-on step. Leafs beautifully on any surface. Oil based. 1 oz (30 ml) glass bottle. Exterior Brush 'N Leaf — One brush-on step. Outdoor gold metallics guaranteed to withstand weather and summer sun for two full years. Oil based. 1 oz (30 ml) glass bottle.